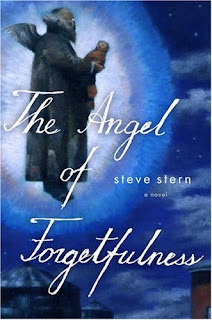 "The Angel of Forgetfulness by Steve Stern. I only discovered Steve Stern's work by accident a few years ago, when I picked up a used copy in a Jewish book store of his short story collection, Lazar Malkin Enters Heaven. I've since read everything of his I could find; he has published about ten works of short stories, novellas and novels. The Angel of Forgetfulness, like much of his writing, is the literary equivalent of gazing at a Chagall painting. While I ordinarily don't enjoy fantasy--never read Lord of the Rings or saw the films--Stern evokes enchanting and irresistible magical realms that easily invite my suspension of disbelief. In the same way that Chagall's fiddlers and cows float across the sky, the characters in The Angel of Forgetfulness freely traverse between the upper worlds and this one."